What to do when your career is over but your life isn't. Reboot! is partly autobiographical. Indeed, the author is working well into his own post-career years, following two failed retirements. He is also convincing in his eye-opening, historically rooted, and hope-filled arguments for engaging in life-long work that is productive and satisfying. Reboot! identifies five different types of work: in-kind, volunteer, Samaritan, enrichment, and paid work. Booters-Baby Boomers-who reject retirement-who incorporate one or more of these types of work into their post-career lifestyle will live longer, live better, and die faster – avoiding boredom, aimless busy-ness, diminished self-worth and the anguish (and cost) of lingering death. With America’s 78 million baby boomers turning 65 at the rate of 10,000 a day for the 18 years between 2010-2028, Reboot! provides a timely and provocative alternative to the conventional idea of retirement. With the promises of Social Security and Medicare about to be broken, Reboot! provides an upbeat and constructive way to plan for retirement within the new financial realities. 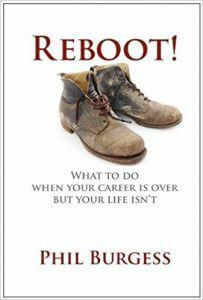 For men and women navigating and planning for life’s transitions, striving to finish well, Reboot! provides a roadmap for living a life of meaning, challenging the reader to be a booter, not a retiree. Burgess boldly asserts that retirement is a deadly disease, and that work after a life of work is the best option for post-career years that are meaningful, productive, healthy, and satisfying. "Longevity is perhaps the greatest achievement of the 20th century. From the beginning of man's time on Earth until 1900, life expectancy increased by about 30 years. From 1900 to the present, it has more than doubled, increasing another 31 years." "Dispense with retirement. Instead, invent a story line for your post-career years, beginning with who you are and what you want to do, then write the script and get on with it! That's what this book is about - a strategy for writing the script for the post-career years of your life." “The luckiest among us will ‘die with our boots on.’ The reason is simple: The most healthy, productive, and satisfying transition to a post-career life will not be a transition from work-to-leisure but a transition from work-to-work – even though our post-career work may be very different from work we performed before we retired." "The key to…post-career success is achieved by purposeful involvement with other people and engagement in a productive and satisfying activity." "Work should not be separated from the rest-of-life [or] compartmentalized – as in the dreadful phrase 'work-life balance.' Instead, work should be viewed as an integral part of – in harmony with – our whole life because work is at the core of daily activity that binds us to others and to the common good, in addition to whatever other social or financial benefits we get from working." “Because of the digital revolution, work in today’s America can be performed in many locations: at home or the office, in the field or factory, or – with the rapid growth of the mobile Internet – on the go…"
"More young people today believe in UFOs than believe the government will honor its Social Security obligations." "When we retire, most of us are healthy and at the top of our game, still able to contribute to family, community, and the larger society. That's why it makes sense, both practically and morally, to continue to use our gifts to help others and to make the world a better place. We are able to do it, and we should do it." "A spiritual concept of work is that work is made for man – not man for work. The mistaken idea that man is made for work would include everything from slavery to workaholism. That’s not the healthy view of work we are talking about in Reboot!" "A life of meaning for most people – religious, New Age, or secular – is to seek to do good and be virtuous, to help others and to make the world a better place." "Looked at from a Judeo-Christian perspective, work well done has a moral dimension: work is both a form of worship and a form of service. In fact, the ancient Hebrew Scriptures use the single word avodah to express all three ideas: 'work', 'worship' and 'service.'"